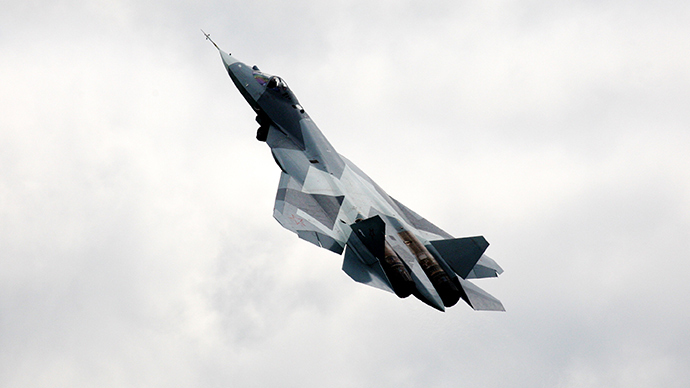 Russia’s first 5G fighter has showed off in full its ultra-maneuverability at an international air show near Moscow. In 2016 the Russian Air Force will get ready to put the first production models of the stealth fighter jet into service. The jet performed such aerobatic stunts as Pougachev's cobra, Frolov’s chakra, the dead leaf and tail-dive. With a month left before the multirole PAK-FA (T-50) fighter is set to be added to the inventory of the Russian Air Force (series delivery slated for 2017), the 5G aircraft’s designers have spilt the beans about the PAK-FA’s operational capability. 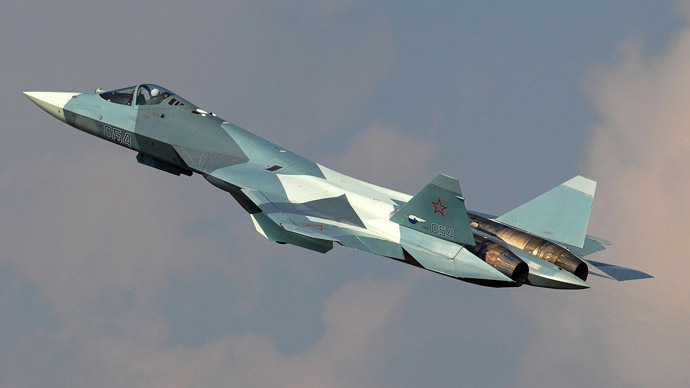 The current 5G jet engines, which are used in the 4++ Su-35S fighter jet, will be replaced with brand new ones designed specifically for the PAK-FA. Even the current engines have supercruise capability and full authority digital engine control. The upcoming power unit in 2017 will be more powerful and fuel-efficient, more reliable and will cost less. There is every possibility that new engine would enable PAK-FA to perform stunts previously impossible on any known fighter jet. In order to fulfill flying tests within the nearest time, three more PAK-FAs will join testing by the end of 2015. So far the fighter jet has delivered on all of the expected technical characteristics. 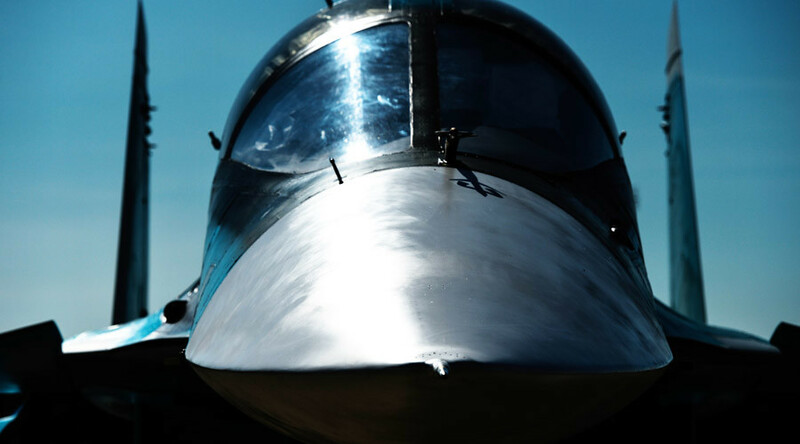 The weapons declared for the 5G fighter make the aircraft multi-task, enabling it to engage targets virtually anywhere: in the air, on the ground, on the water and even underwater. The tests are now underway. All weapons and technical innovation in design for the PAK-FA are promised to be ready by 2020, which, among others, will include 12 types of missiles alone, six of which are to be ready by 2017. Some of the PAK-FA missiles will be hypersonic, with most designed specially to fit into fighter’s inner bays so as not to interfere with its stealth characteristics. Some of the PAK-FA missiles are already being tested with “excellent results,” Air Force Commander-in-Chief Viktor Bondarev told journalists. Apart from a set of short-, medium-, long- and ultra-long range air-to-air missiles, PAK-FA’s weapons list include at least two anti-ship missiles with range from 160 to 260km. With a 10-ton overall payload, PAK-FA is also armed with a variety of high-precision GLONASS-guided bombs that could weight up to 1.5 tons and be delivered at speeds of up to 1,100kph. The PAK-FA’s weaponry even includes an anti-submarine bomb that can target any submersibles to a depth of up to 600 meters. Unlike the American F-22, so far there have been no reports that PAK-FA will carry missiles with nuclear warheads. 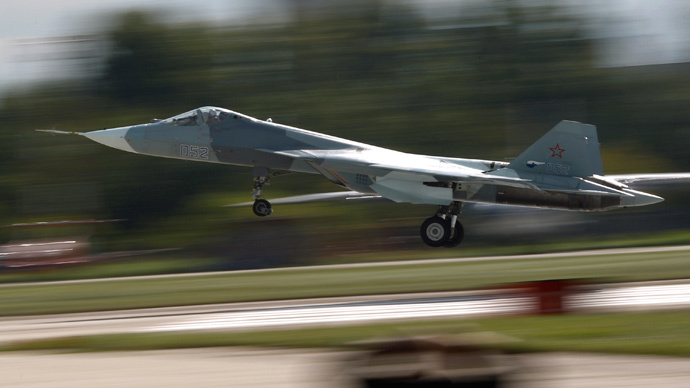 The PAK-FA will have a fully digital weapons direction system developed by Radio-Electronic Technologies Concern (RETC). The aircraft is detecting, classifying, tracking targets and performs target assignment in fully automatic mode, so the pilot only needs to make a decision to attack and choose a weapon. Most of the fighter’s weapons are fire-and-forget munitions. 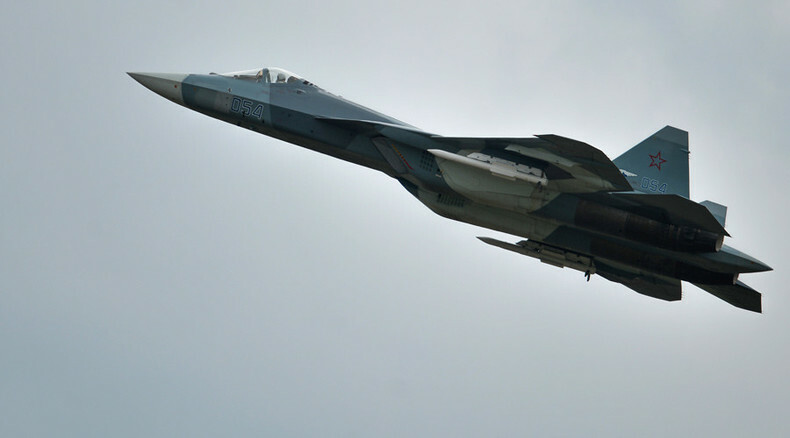 For short-range dogfight and elimination of lightly armored ground targets PAK-FA is armed with the world’s lightest 30mm air cannon 9A1-4071K, weighing a mere 50kg, and with an effective range of up to 1,800 meters. The PAK-FA’s hull and wings are stuffed with multiple sensors and detectors, which form the so-called ‘smart skin’, giving the pilot full information about what’s going on for all 360 degrees. The fighter’s radar is fully integrated with active electronic defense station ‘Himalaya’, enabling the aircraft to do electromagnetic warfare as addition to its weaponry, jamming enemy aircrafts and missiles within the station’s reach.